Loaded Baked Potato Soup is a creamy, hearty, and comforting soup that has all of the flavors of a loaded baked potato. My very favorite food is the potato. Some people might think the humble potato is boring, but I swear I could eat potatoes every day and I don't think I would ever get sick of them. When I was a broke college kid, I would buy a big bag of potatoes and eat one for each meal. That's frugal living right there. You can get a lot of meals out of a 5 lb bag of spuds! You'd think by the time that good old financial aid came in I would have sworn off potatoes for life, but nope. Never did tire of them. I just love them SO.MUCH. It's hard to pick my favorite way to prepare them, but a loaded baked potato is pretty high on the list. We love to make baked potatoes on the grill then top them with butter, bacon, cheese and sour cream. I love the crispy salty skin, tender flesh and all those toppings! YUM! 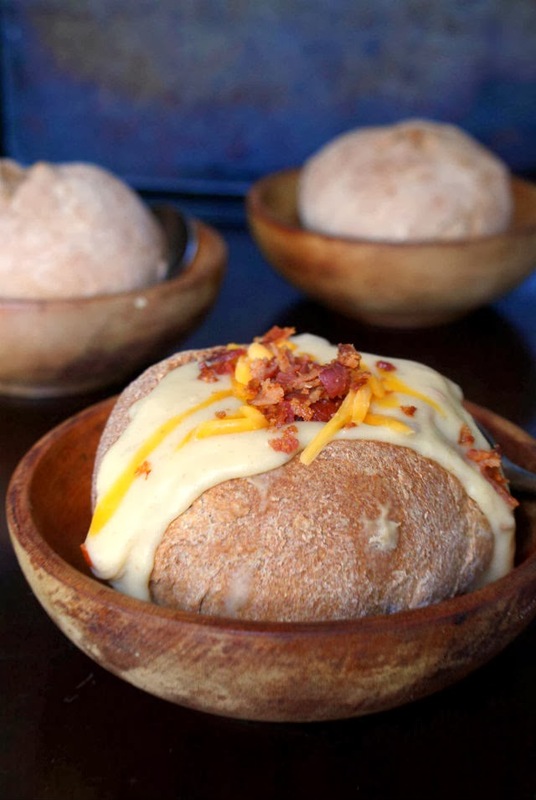 This hearty and delicious soup features all of your favorite loaded baked potato flavors. It's perfectly rich and comforting for the chilly winter months. You can make this soup as thick or as thin as you like (see Notes) and serve it in a bowl, or in a chewy bread bowl, which is my family's preferred method. I highly suggest you whip up a batch of this creamy, hearty, and delish Loaded Baked Potato Soup very soon. I know you won't be disappointed! Boil the potatoes in the chicken broth for 10 minutes, or until the potatoes are tender. (If your potatoes are huge and the chicken broth doesn't cover the potatoes in the pot, just add more chicken broth until the potatoes are submerged.) Don't drain them when they're done! Use an imersion blender (or a potato masher) and mash until the potatoes are your desired consistency. If you like a chunkier soup, leave big chunks of potatoes. Meanwhile, in a large heavy skillet over medium-high heat, cook the bacon until crisp and remove to a paper towel-lined plate. Crumble it into little pieces. Add the onion to the skillet and cook it in the bacon grease until the onion is tender, about 4-5 minutes. With a slotted spoon or spatula, transfer the cooked onions to the potatoes. Drain off the remaining bacon grease from the skillet and discard. Return the skillet to the heat. Add the butter to the hot pan. When the butter is melted, add the flour to the pan and stir with a whisk for 2 minutes. Slowly add the milk to the flour mixture stirring constantly. Simmer the mixture for a few minutes, continuing to stir until the mixture has thickened. Add this mixture to the potato mixture and stir to combine. 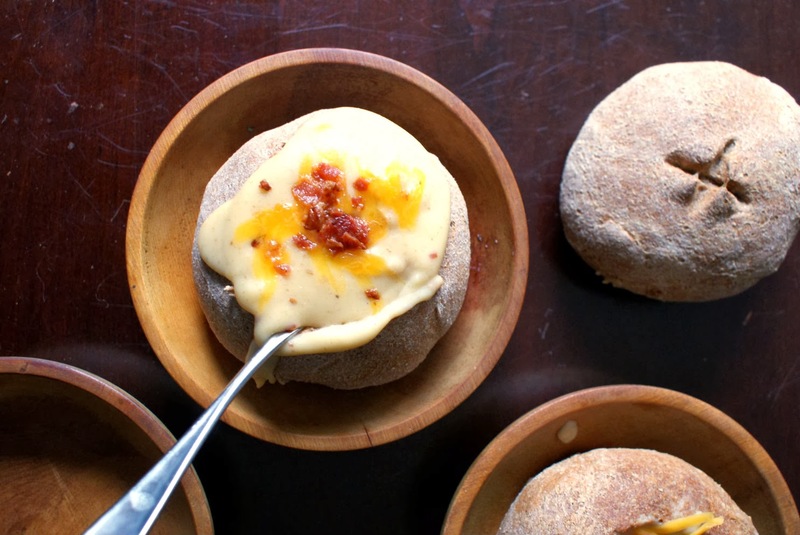 Add the cheese and crumbled bacon to the soup, reserving a couple tablespoons of each to use as a garnish. Stir in the salt, pepper, and sour cream. Simmer for a few more minutes until the cheese has completely melted. Garnish with the reserved shredded cheese and crumbled bacon. I like a hearty, thick soup. If you like a thinner soup, or if your potatoes are extra big and everything comes out too thick, you can add up to 2 more cups of milk to get to your desired consistency. Add it to the soup after step 4 and simmer for a few extra minutes before moving on to step 5. 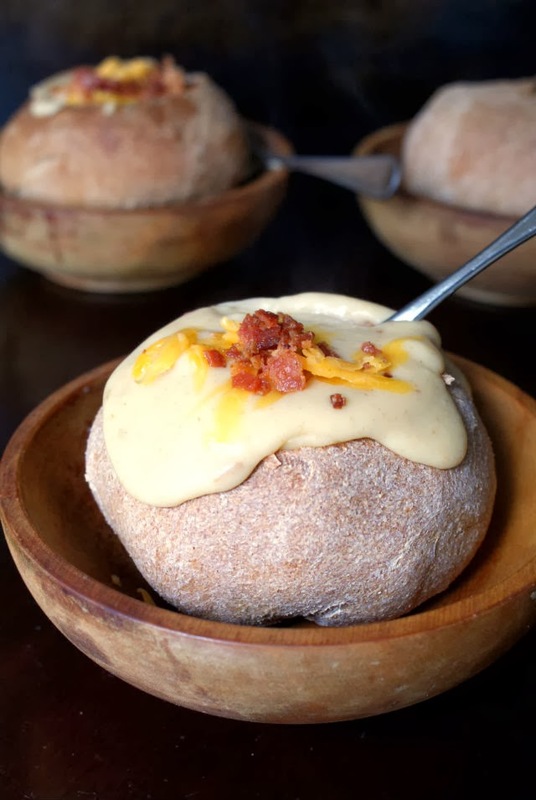 We like our potato soup served in bread bowls. The bread bowls pictured are 100% whole wheat, made by me. You can also top the soup with chopped scallions, I just didn't have any this time around. Yum!